IGN score 8.4. 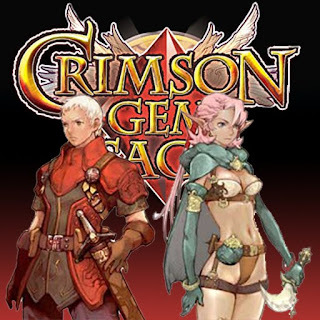 ‘Crimson gem saga’ to achieve an average mark of 80 in North America PSP(TM) RPG Game-Webzin. It's an adventure fantasy to find out the Crimson gem, Wicked stone with a power of control of mind. It will be a best gift to users enjoying JRPG style, an easy game to operation and understand. To re-create more and more realistic event scenes emceeing full voice over 60% of the event dialog. No tile map graphic. A beautiful background graphic by handmade painting. Sweeping changes of interface by user(I-phone/I-pad) characteristics. Playtime is over 30 hours. 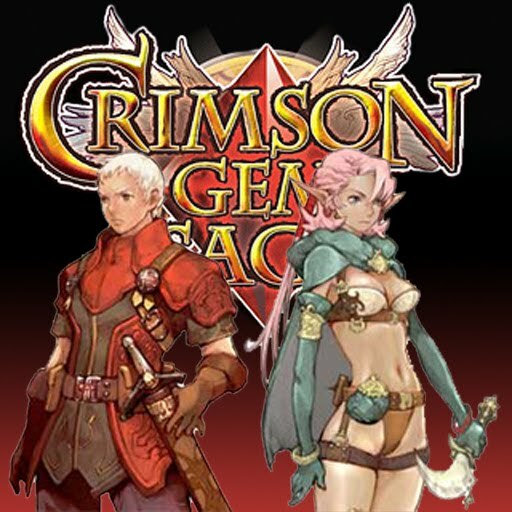 Please visit us at the actual Crimson Gem Saga thread for the iPhone/iPod at Touch Arcade! I'm really looking forward to this game what can we expect price wise and release date. Also great job with iTarus amazing port. Love the art style and gameplay. Even voices add depth but it needs updates. Please read Manacor's review in app store for full details. the game keeps shutting down when i try to enter the acadamy. I am using iphone 3G, is anyone else having this problem? 이거 조작감은 반드시/시급하게 수정하셔야 될듯 합니다. 터치만으로 조작하기에는 너무나 버거운 인터페이스 입니다. 버튼들이 작게 배열되서 잘못눌러서 엉뚱한 스킬을 쓰거나 엉뚱한 아이템이 먹어지는 일이 부지기수네요. 게다가 뱃지로 스킬랭크업하려하면 원래 게임 화면으로 돌아와지지도 않아서 게임을 꺼야하는 치명적 버그까지 있습니다. 빨리 픽스 업데이트를 내주셔야될듯.. I am the webmaster of iJackPhone.com, an italian website. We are a huge community of iPhone, iPod and iPad fans, and we take reedem contest for our users to promote new applications. I am contacting you to know if you are interested in making some reedem contest with us with your recent app, giving us some promo codes. We can provide a review with the contest. If you have any question, please contact us at this email address. You can't use bronze medallion it won't let you exit the menu screen. The only way to get out is restart the game which is stupid. That means there's no way to upgrade your skill ranks. There's no ok or cancel button present. The battle system is not complete. This game on the iPhone needs some serious updating. I can't believe they release this game which is already on the psp console with so Many bugs and problems. What were you guys Thinking!?!? Same as Phil...someone needs to fix this now! I'm not playing this game until this Medallion issue is fixed. I am very interested in the game, but I am not willing to compromise the game-play just to move forward and forget about the bugs. You can apparently get out of the menu using silver and gold medallions tho, so, not all is lost. But I'm holding out until on playing the game until issue is fixed in a update. I suggest others do the same, but with purchasing. The game really needs some work. BUT its still very annoying when you need to scroll all over again in the inventory list! Would you please update the game? The Medaillon-Bug is very, very annoying!!! When you left your device in stand by (screen off) with the game open the time keeps counting and counting. That shouldn't be a problem, but when you reach the 99:59 hours the game automatically exits. Any solutions for this? I'm really upset. I was near the ending. - Henson Wizard Aura is not regenerating any MP at all. - Amulet of Restoration works when you first equip it. After saving the game with Amulet of Restoration equipped, restart the game, and then loading the save, it no longer works. Solution: Don't equip Amulet of Restoration before saving, equip it after loading the save. Anyone know the solution for Henson Wizard Aura not working? Hey Nate games, Crimson Gem Saga game for the iPhone is so riddled with glitches, that It's barely playable. I'm five hours into the game, and I've experienced about 11 crashes already. Also, menu navigation in the game is a complete nightmare. 10 dollars is very expensive for an iPhone app that BARELY WORKS.Even 5 bucks is too much. When are you planning to update your game?! After you reach 99:59:59 game closes for no reason in need of serous update patching. I'm having a problem at the riverton area... there's juz no way to get into the town..! Other than tat juz a few crashes here n there which is bearable..
but the riverton area is juz annoying to keep crashing n to reload all over again.. Please look into tis problem.. The passive skills doesnt work along with other regen amulet, it works for a while but then when u save and reload the game it wont work anymore unless you unequip it before saving it. Pls fix it. I am playing CGS with IPAD. It works great at 1.01 version. After upgrade to 1.11 all I see is black screen after loading!!! Pls fix!!!! 1.1.1 broke the game for me too! Also on iPad. Please fix! Want to keep playing! It looks like the blank screen bug is just that the opening video doesn't show. If you wait for the video to complete, you get the normal opening and can play. Very annoying to have to wait for that video to complete. (since it doesn't show there is no way to skip.) I am also on iPad. WOW please!!!! you need to lower the cost of items in this game. its TOOO MUCH! you either need to increase the amount of genders made or lower the price of items like armor. if there was only a hack for the iphone verison. I would be soo happy. But it give me black screen after I kill the final boss!!! I want my ending movie!!! Why wont you tell us anything? Are you planning to release a new version? We paid for this game! 10 bucks! I didnt pay 10 bucks to get some faulty crap! You had better fix this! wow thos game crashes alot when I enter new towns...its almost as if the iphones limited memory (ram) can not handle the info or this was a huge mistake to port a game. After finding the cannon from the maze dungeon...killian used the cannon to kill spawns on a bridge-I passaed that part. Now going down a little south ... the game trys to load and BAM it crashes, over and over again. After the fight at the bridge, i want to go to the new town, THE GAME CRASH! I try it many times, but the game always crash at the same area. I deinstalled the game and installed new and start a new game - but again at the same area the game crash. When playing the intro video, the screen is black. You can only hear the sound, and cannot skip the video. If you quit + restart, even though the video is done and you have the "Tap to start" screen, you can't press anything. after "tap to start" screen appears, press sleep button, and then after it sleeps press home button to unlock it, then you will hear the game sound.. this game is nice, but soooo buggy.. just fix it please.. damn i paid $5.99 (lucky for me it was 50% discount) but it is still to expensive for this buggy game. It has been several months since you released a BUGGED update. Fix your damn game!!!!! I upgraded to a new phone, and I cant reinstall the game after restore, please advice. I haven't experienced any of the bugs mentioned but my version is the one that existed prior to the latest update. Why doesn't Nate Games just bring back the older version (version 1.0.1). im on 1.1.1 just at the monk part crazy guy seeing people, get the mirror, and it crashes EVERYTIME I try to go into Hasburg. The passive ability for Henson "wizard aura" is still not working in the latest update. Please fix this bug then the game would be perfect. As Hensons abilities are MP based makes the character almost useless without regening MP. Will this game ever get multitasking support? I use ipad 2 and this game crashes after every other battle encounter. It's totally unplayable. This is game needs an update. It crashes whenever you get ambushed in a battle. People have been complaining about this bug for a while now and it makes the game completely unplayable. The 1 star reviews on iTunes are beginning to stack up as well. I paid $10 for this game and I should at least be able to play it! PLEASE fix this bug! PLEASE release an update! Every two or three enemy encounters, the game crashes. I love this game and this is my second playthrough. I never had a single crash in my first playthrough but now i'm having them so often i'm thinking of quitting the game entirely. I'm right after the part where Killian blows up the bridge. I was really loving playing Crimson Gem Saga on my iphone until tthe iOS 5 update to my iphone. Now the game crashes every minute!! &everytime right after the first "boss battle" on the bridge (I had to start game over because the iphone update lost my game save too). So Im stuck & I just recently paid $9.95 for this game 2 weeks ago. Will you please tell me if an update is in the works for this game crashing iOS 5 update issue? When do you think an update might be released?? &the menu selection could use to be slowed down as well because it is near impossible to select an item in between the first &last item. I am having crash issues as well. Please fix this or at least update the i-tunes store to let people know. This game better receive a patch soon. I just bought this. otherwise Im going to demand a refund. tend this masterpeice so that we may enjoy a good RPG game. Thank you. fix the goddamn thing!!! it always hang every beginning/end of 2nd battle or map changes!!! $10 ain't cheap for a buggy game!!! move your asses and get the freaking job done!!! Did you get your answer from them? Just Redownloaded this game to try it on my iPhone 4G on iOS 5.0. It crashes A LOT and the sound fx and music cut in and out often. It does not support multi-tasking, and I imagine they aren't going to bother fixing it. Too bad. I was going to recommend this to a few new iPhone/iPad owners. But it shouldn't be on the app store anymore since no new customer can even play it. Can someone let us know if we are going to get a fix for the iOS 5.1.1 crashes? I downloaded this game yesterday and I am completely amazed that this is still in the App Store. The game is completely unplayable. How do I receive a refund for this? I basically just handed them over 10 bucks for nothing. Can't even play the game, after two battles, the sound goes off, when you try to enter a third battle it completely crashes. I know the designer has added the auto save function so you dont lose your save point, but i shouldn't have to keep restarting the game every 2 minutes, its ridiculous. I paid £6.99 for this game on 29/08/10, 2 years ago! and i still haven't got past the first level because the app keeps closing itself down. The only response we get from itunes is to contact the games designer which everyone is doing but I have not seen a reply on how to fix this! IOS 6 doesn't fix the fault, i've tried it and its exactly the same, its a problem with the game and its unacceptable that its been faulty for this long. Please can the designer of this game answer everybodys question and get this game fixed! Fix the bloody game you scumbag i bought the game for 9.99€ and i cant even play the game. This is a FRAUD why id it still on app store? like the sound disappear randomly, and after 2/3 battles when we try to fight another monster the game just keep crashing -_-"
Please fix app crashes.change user interface like ff square enix other than the game is great ! Come on! Find a way to fix this game. $9.99 for this?! I am contacting you because this came crashes frequently on the iphone 4 and 5, yet it is still for sale in the store for 9.99. I am also filing this complaint with Apple, and providing them with a link to a webpage where numerous customers are having the same issue. I am providing this link to you as well as proof there is an issue. If you are going to keep this game for sale, you have an obligation to make sure that it works. I downloaded this game a few weeks ago on my ios7 device...but it crashes constantly :( when I first start the game, I can hear the intro music but the screen stays black (that's pretty weird) and after 10 to 15 minutes of playing the game crashes! Please do something about it! I haven't spend that 10 euros for nothing! What's wrong with this game !! ?? Just dl it and it kept crashing !! L'écran reste noir comment je fais??? Can't seem to play the game, screen stays black. Fix it or refund. I downloaded this game a few weeks ago on my ios7 device...but it crashes constantly :( when I first start the game, I can hear the intro music but the screen stays black (that's pretty weird) and after 10 to 15 minutes of playing the game crashes! Please do something about it!